In October 2015, I had a consultation. A couple had just moved in together into a 1930’s three bedroom semi-detached house in a leafy part of north Leeds. A lovely sized home which held many wonderful treasures. But with all this stuff from two houses being merged together, both with competing design styles… the main living space wasn’t really working. Oh and throw in a new born, just for fun. The living room already had a cool selection of retro, Africana and vintage pieces. A Parker Knoll armchair, taxidermy, old maps, collectors drawers, new maps, pops of orange, brass and copper accents and various pieces of unique, gnarly furniture. It was all there. But it was just a mish-mash. Add in that 70’s tiled fireplace and the room was all over the shop. The colour of the room, I decided upon about an hour into the first consultation. I just knew it would work for them both. A dark, vintage green, using copper and orange as the accent colour was going to make everything in this room sing. “Retro Gentlemen’s Club with a Dash of Taxidermy”. How does that sound? Yeah, yeah we like that. Ok cool. Let’s do it. Valspar’s Sherwood Forest was used on all the walls and woodwork. By painting the coving and skirting boards the same colour, it seamlessly stretched the space outwards. The space wasn’t chopped up by having another colour running down the length of the room. It just works. Yeah, it’s a dark colour, but it provides the backdrop to everything this room had. The rich woody tones of the furniture, framed art and orange and metallic details really pop out against these walls. This room is big, it needed to go big or go home. The old tiled fireplace was ripped out and sent to the tip. Then followed some precision re-building of the concrete inner. My plasterer did a great job. I designed the “fire surround”. It was ridiculously cost effective. Took about an hour for me to measure and level, mask up then paint the design. It doesn’t take up any floor space or visual weight, but gives the room the traditional focal point it needed in a quirky, contemporary way. Nobody ever takes a photo of the TV, but I wanted to show you where it went. After all, this is a real home, with people that want to watch the telly box from time to time. They never look pretty in rooms, but I think we got away with it here. A tree trunk side table, with trailing ivy flowing downwards. Plants are the best accessory in a room. Especially a room called “Sherwood Forest”. The old yellowy-cream carpet was taken up and tipped. The floor boards were repaired, boards filleted in where there was once concrete, then all sanded and stained. We chose a warm oak colour with undertones of orange to add a hint of the retro. An expensive option, admittedly, but such a good investment as it will give them a winning floor for years to come. No carpets necessary. Ever. Two oversized, “acid” vintage rugs from Benuta were purchased. They zone the areas perfectly, also adding serious colour and character to the huge open-plan floor space. Gold velvet, full length curtains add a touch of luxury to the room. The white feather Melito pendants from B&Q were a super cost effective way of adding distinctive, textured lighting without breaking the bank. Unfortunately, the one item I hoped we could squeeze in budget wise, didn’t make it. The new sofa. The floorboards ate into a large part of the project, which meant, for now… they’ve transported their old sofa from a previous house to this room. It’s the not the perfect solution to this room by any means, but it will keep them sitting pretty for a while. The large brown leather “unit” was broken up with a gorgeous mid-century woollen blanket, sourced from a recent trip to Hebden Bridge. And the obligatory velvet and sheepskin cushions don’t do any harm either. A bespoke unit was designed and built to hang above the sofa in an effort to keep this room clutter free. The shelves happily house oodles of books, weird stuff, plants and a cute little Hektar task light, great for reading. The ceiling was painted in Valspar’s Gentle Shadow. A warm, off white with the tiniest hint of green in. A kind of vintage white, which worked beautifully with the rest of the room. The original 1930’s door was restored and stripped back to its original state. And left. Because it didn’t need anything else. The wood grain itself was beautiful enough. Cheeky flashes of Valspar’s Storybook Sundown, pop out throughout the room. More orange detail can be seen down the sides of the bookcase in the living room. An amazing, full length gallery wall, where each picture comes with a story. I’ve learnt a lot about the people that live in this house. Probably too much. A nod to Rene Magritte. The million dollar floor lamp and bespoke african lampshade looking resplendent. And an original 1960’s touch button phone resting on a “well loved” Art Deco drinks cabinet. This corner sums up the room in one shot. How gorgeous does that copper lamp base look against that rich green? The piano was moved from the hallway (where it was never played) into the dining area where it is now seen, played and loved again. A large, gilt framed mirror was hung to bounce the light back into the darker end of the room. As soon as it was hung it doubled the amount of light coming from that lamp. The magic of mirrors. The copper cage pendant light, again from B&Q, casts the light all around the dining room. And again, is set off beautifully by the green walls. Another, larger mirror was hung in the dining area, bouncing yet more light back into the space. It also gave the room two gallery walls for the price of one, so whichever side of the dining table you sat, there was something beautiful to look at. The old chimney breast recess had some bespoke, heavy duty shelves fitted for a big vinyl collection. This built-in solution negated the need for a separate piece of furniture, keeping more of the floorspace free. Whilst simultaneously looking frickin awesome. The decks are set up in the alcove to the right. Perfectly placed for a spot of mid-afternoon tea and disc-jockey-ing. The whole room feels connected. Homely. Traditional yet quirky and like it was meant to be like this. The room and everything in it just makes sense now. Everything has a place. Both practically and aesthetically. I have been told by my clients that recent visitors have been bowled over by the transformation. And I agree. It is very them. It’s full of memories, colour, history, authenticity, fun, detail and space. This room is theirs, all theirs. This project has really stretched me…in a good way. The homeowners (now good friends) have let me run wild in their home and I’m very grateful for the chance to design and create this space for their family of three. I could barely leave the room after I’d finished taking the photos. I just kept walking around, grinning and looking back at all the decisions I’d made and details I’d considered. A lovely feeling. If you’d like to read what the homeowner thought of the project, you can check out the review here on Houzz UK. I cried when I read it. I’m such a softie. So now, i’m going to have a cup of tea and a Tunnocks to celebrate. Sherwood Forest is now complete and another Making Spaces project is under the ol’ belt. Would LOVE to hear your thoughts on the room, the process etc.. I hope you love it as much as we do!?! It’s absolutely amazing Karen, so lovely to see the complete transformation – you’d never think it was the same house. And what a lovely review on Houzz! It’s just so fabulous. I love it. When are you doing my house? OMG- I love how you have found homes for the books in alcoves and on the shelves, everything about this room is just lush!! WELL DONE!! Wow, it looks amazing! I love those rugs, they’re gorgeous. The style seems very ‘Abigail Ahern’ like (or maybe her style is Karen Knox like!). Lovely, must be like stepping inside a jewel! 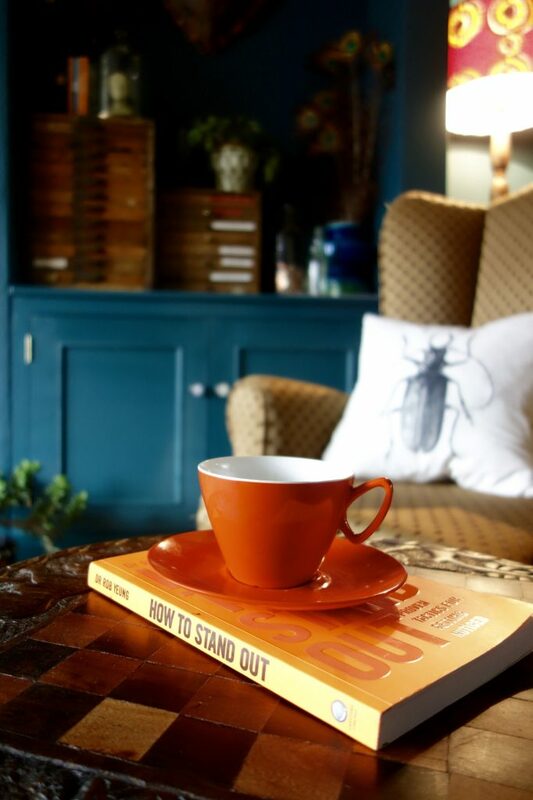 Great to see rich colours on the walls and in the furniture and accessories, looks so cosy. My favourite bit is the little record nook – want! This is absolutely amazing!! I actually cannot stop going back to the picture on Pinterest and just staring at it! Loved reading your blog and getting tips about how to make such a bold wall colour work and dealing with such a big floor space 😮😍👍🏼😬👏🏼 I hope you got the biggest hug from the homeowners!!! Ps where is the blue based lamp from next to the piano?? I love it! Would be perfect in my living room!!! Which orange paint did you use for the fireplace? It looks beautiful. This is beautiful, just beautiful. I just painted my smaller living room Sherwin Williams Oceanside which on my computer looks very similar to Sherwood Forest. My family wanted to keep the skirting boards white but we did paint the ceiling the same blue. Orange was already an accent. I am debating curtain colors emerald to blend with the walls, raspberry or another bright to use in this and the adjoining yellow room. Thinking I may paint the unframed archway between rooms to match the curtains. Your area rug choices are inspiring. Thank you, thank you. I love this color, but I could not find. — the Sherwood Forest looks a lot greener than the room. Help Please! This is a UK Valspar colour, am guessing you’re comparing it to the US colour?